Our daily lives are immersed in so much communication – words, pictures, graphics, gifs and boomerangs – that’s what we use to express our feelings. But have we realised how colour can make such a deep difference to what we say? Rang De gives us that chance to explore our emotions through colour. Rang De is a one-of-its-kind Pre Holi Bash. Happening on Saturday, March 16th 2019 in Kandivali east, Rang De invites all to come and celebrate colour, celebrate community and celebrate life. Organised by Maa2Mom and Avsar, this event is all about a world of colours, dedicated to Holi – our beloved festival of colours! Rang De will witness exciting activities for all men, women and children all day long. Hues and colours will create the festive and fun atmosphere through the day. Unique stalls, activities and food will render the perfect ambience to welcome Holi – the festival of spring. Friends and family can come to enjoy and experience some very uniquely curated events here. From group dance contests to power-packed Zumba, a DJ party with DJ Amit and painting and DIY activities for young and old – here’s your chance to enjoy an entire morning with creativity and colour. The Rang De evening is an incredible line up of cultural events. Celeb singers and musicians grace the Rang De stage – come and watch Pamela Jain, Krishna Berua and Sarvpreet Singh create sheer magic with their music. The National Lever Odyssey Dance group will enthral you with their moves. And while we’re on this road – watch out for the ramp that has Rang De kids adding more brightness to the colours around! One of the highlights of Rang De is Talaash -A collaboration of Storytelling Live Music and Live Painting! This is something you would have never seen before.Three artists: Storyteller Swaraj Singh, Musician Baksheesh Singh and Painter Rupesh Sharma come together in a spectacular act. Rang De will be hosted by RJ Rahil Khan of 107.1 FM. How’s that for some really vibrant pre-Holi plans? You really don’t want to miss this one! Book your tickets now! It doesn’t take a genius to figure out men’s obsession with women and bikes. But what if the women too turns out to be obsessed with bikes. It’s going to be like a “Sone Pe Suhana” kinda offer for these Indian men. Yes, Bollywood actresses have turned into biker chicks and are riding bikes both offscreen and on screen. Many of our Bollywood directors have time and again tried to play along the same lines, bringing together our sensuous actresses on bikes. The combination of women on bikes is very thrilling and hot too, Heena Panchal stunned us with her bike riding skills when she was spotted ridding bike at Palm Beach road Vashi and she was just too brilliant with the riding skills. The actress spent quite some time training and rode the bike to perfection. National Company Law Appellate Tribunal, Delhi has upheld the order passed by NCLT-Chandigarh there by directing the parties including Mrs. Aruna Oswal, Chairperson, OAML to submit written response to a petition filed by Mr. Pankaj Oswal on the mismanagement happening with in the companies. The NCLT – Chandigarh on last hearing on 21st May 2018, passed an order asking the all the respondentsMrs. Aruna Oswal, Chairperson, OAML, Mr. Anil Bhalla, MD OAML, other directors, Mr. Naveen Jindal, OAML’s Company Secretary and Auditors M/s T.R. Chadha & Co LLP to file their written responses to our petition. On 29th May, 2018, an appeal on behalf of Ms. Aruna Oswal was listed before the Appellate Tribunal at Delhi challenging this order of Chandigarh NCLT. However, This Appeal of Mrs. Aruna Oswal was out-rightly dismissed by the Appellate Tribunal, ordering the parties to comply with NCLT Chandigarh’s order. Therefore, now all the parties are bound to comply with NCLAT’s order of Appellate Tribunal and ought to file their written responses on next hearing at Chandigarh. Late Sh. Abhey Oswal’s eldest son Mr. Pankaj Oswal had filed a legal proceeding under the Indian Companies Act at NCLT, Chandigarh on the 1st of February 2018 for mismanagement, misappropriation and Related Party Transactions clandestinely happening in his late father’s companies Oswal Agro Mills Limited (OAML) and Oswal GreenTech Limited. Mr. Pankaj Oswal is one of the legal heir who is deprive from his succession rights and seeking transfer of his companies’ shares. Late Sh. Abhey Oswal held 53530960 shares in OAML and therefore Mr. Pankaj Oswal is entitled to 13382740 shares by way of transmission as legal heir of Late Sh. Oswal. ‘खल्लास ‘इस फिल्म की कहानी प्रीत प्रकाश शर्मा द्वारा लिखी गयी है जिसका निर्देशन अमन खान करने जा रहे है.फिल्म का संगीत काफी बेहतरीन तरीके से तैयार किया जा रहा है .फिल्म का निर्माण दो भाषाओ में किया जा रहा है इसलिए सभी गाने दो भाषाओ में रिकॉर्ड किये जाएंगे .गुजराती में संगीत राज सेन और मारू ब्रदर्स द्वारा दिया जा रहा है और हिंदी गानो के लिए मोन्टी शर्मा द्वारा बनाये गए संगीत फिल्म में दिए जा रहे है .फिल्म के कलाकारों का चयन फ़िलहाल किया जा रहा है और बहुत जल्द फिल्म की शूटिंग शुरू की जाएगी..
Actress Srishti Sharma Comming in new avatar as a Nageen in Chidiya Ghar. As a Special entry. MUMBAI, November 1st, 2015 – On Saturday, 31st October, Jio MAMI 17thMumbai Film Festival with Star India’s Movie Mela, India’s first movie carnival witnessed a staggering turnout of over two thousand movie fans and celebrities who came together to celebrate their collective passion for the movies. The event which was open to all delegates of the Jio MAMI 17th Mumbai Film Festival With Star India took place in the iconic Mehboob Studios in Bandra and kicked off with a session by Rajkumar Hirani and Abhijat Joshi on their creative collaboration. This was followed by a once-in-a-lifetime reunion of the team of Mr. India. Sridevi, Anil Kapoor, Boney Kapoor, Satish Kaushik, Aftab Shivdasani, Huzaan Khodaiji, Karan Nath and Ahmed Khan took a walk down memory lane as an audience of 800 listened enthralled by anecdotes of how the much-loved classic was made. Simultaneously on Stage 2 of Mehboob Studios, Kabir Khan, Dibakar Banerjee, Zoya Akhtar did sessions that explored their creative process. Later in the daySonam Kapoor and Rohan Joshi of AIB were in conversation about the challenges of being a celebrity in times of social media. Huma Qureshi was in conversation with director Gurinder Chadda and Ajit Thakur, CEO of Trinity Pictures and Shridhar Raghavan conducted a masterclass on script-writing. And that wasn’t all, Varun Dhawan was in conversation with Anupama Chopra and Rajeev Masand on the films that shaped him. Deepika Padukone spoke about her eight year journey in the industry. 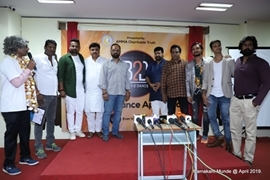 The evening also saw a stupendous congregation of the leading talent from Bollywood for a panel that explored the altering landscape of the film industry. Alia Bhatt, Arjun Kapoor, Parineeti Chopra, Ayushmann Khurrana, Aditya Roy Kapur and Kriti Sanon spoke candidly about the challenges of being a next gen actor. The day concluded on a musical note with composer Pritam strumming his popular hits and talking to the audience on how he made his signature tunes. SIC Elegant Productions THE LAST HORROR as the name suggest is a suspense HORROR movie, written and directed by Salim Raza and produced by Sharif Ansari. The film has photography by Chandrika Prasad Gupta, music by Sayed Ahmed. The film is distributed by Aeries Films/Hyder Gola will hit the screen on October 30, 2015. Today nobody is happy in the world as each individual is surrounded by one or the other problem and in this tensile atmosphere, Daily Multimedia Limited’s movie Hogaya Dimaagh Ka Dahi provides relief. The film is out-an-out a pure comedy entertainer with good humour and sheer language for which the credit goes to Fauzia Arshi, who has done a brilliant job in her debut directorial venture. A satire in the comedy genre, the basic plot of the film is about relationships where life can be taught through experiences. The story is tailored around Tom and Jerry concept having 5 Toms and 3 Jerry in the movie. The characters in the film are put into complicated yet humorous situations where they run, chase, fall and again get up in life and in doing so, understands life. Performance wise, director has handled all the five protagonist Kader Khan, Om Puri, Rajpal Yadav, Sanjay Mishra and Razak Khan perfectly, who have come out with the flying colors. The remaining cast of the movie Chitrashi Rawat as Saara looks charming, alluring and promising. Amita Nangia, Vijay Patkar, Bunty Chopra, Danish Bhat, Amit J and others lend adequate support. Shahbaaz Khan has given a million dollar performance in Maula Maula song which is one of the highlight in the movie. On production front, film is up to the mark. Technically, story is interesting, screenplay is sharp dialogues are witty, cinematography is eye soothing and editing is brisk. The film has four songs but pick of the lot is Maula Maula, a sufi song rendered by Kailash Kher and Fauzia Arshi, penned by Allama Iqbal and Amir Khushro, title track Dimaagh Ka Dahi, a peppy, spicy entertaining, written by Shabbir Ahmed in the voice of Kunal Ganjawala and Ritu Pathak regales and worth mentioning is a solo number ‘Kabhi To Sun Ghaur Se’, beautifully penned by Ravi Chopra and sung by Fauzia Arshi is ear pleasing. The last one ‘Baap Hona Paap’, sang by Mika Singh and written by Anees Ali Sabri needs is catchy. The music composed by Fauzia Arshi is very lilting and melodious, she is the surprise addition as a music composer. As a debutant director Fauzia Arshi is up to the mark and excels in all the departments writing, music as well as direction. The movie is produced by Fauzia Arshi and Santosh Bhartiya. On the whole, Hogaya Dimaagh Ka Dahi entertains from first to last frame and it is meant for all ages. Surely, the film will make its producers and distributors happy. Mumbai, October 2015: Former student of the prestigious Le Cordon Bleu, London, Chef Toshin Shetty, embarked upon his journey to fulfil his patisserie dream on Wednesday, October 14 with the launch of artisanal patisserie and his namesake, Toshin. The launch took place at Ivy Banquet, Chembur. Renowned personalities like Shriya Saran, Gulshan Devaiah, Pooja Bhatt, Sivamani, Sandeep Chowta, Atul Dodiya, Anju Dodiya, Sunil Padwal, Bose Krishnamachari, Sudarshan Shetty, Riyas Komu and Vivaan joined the young chef in the celebration. At Toshin, the 25 year old Chef promises to serve you macarons, cookies, handcrafted pralines and desserts that will stand shoulder to shoulder with the best in the world. Whether digging into a chocolate cookie that is sinfully gooey or bite into a macaron that is lighter than air, every bite you eat at Toshin is guaranteed to leave you blissfully satisfied. The pralines are handcrafted and expertly tempered to ensure that you only get the very best experience. The journey that began with a desire to hone his skills and learn the intricacies of pastry making that took Chef Toshin to Le Cordon Bleu, London and around the world. It is during this time that he truly developed his love and passion for pastry and all things. The ingredients used in making the confectionery are pure and original, crafted with passion, love and care and with leave you with unforgettable flavours and sweet memories. Toshin is an effort in altering the fabric of time and bending the barriers of geography. It is the belief that a bite of a truly world class dessert doesn’t just silence the cacophony of the world but transports one to another time, sometimes that becomes a trip down memory lane and at other times it is the realization that going forward nothing will ever be the same again. In this endeavour of creating timeless confections our sworn allegiance is to pure and original ingredients. We don’t mix compromise in any of our recipes. The best ingredients and the freshest produce ensure that the desserts, ice creams and chocolates leave you with unforgettable flavours and fresh memories.